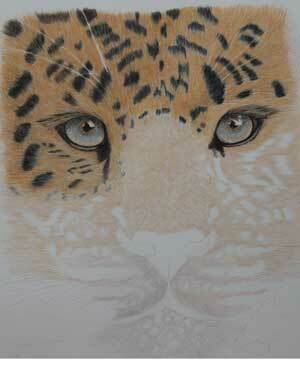 Line drawing completed from photo reference, and commenced first layer of coloured pencil at top left hand corner. 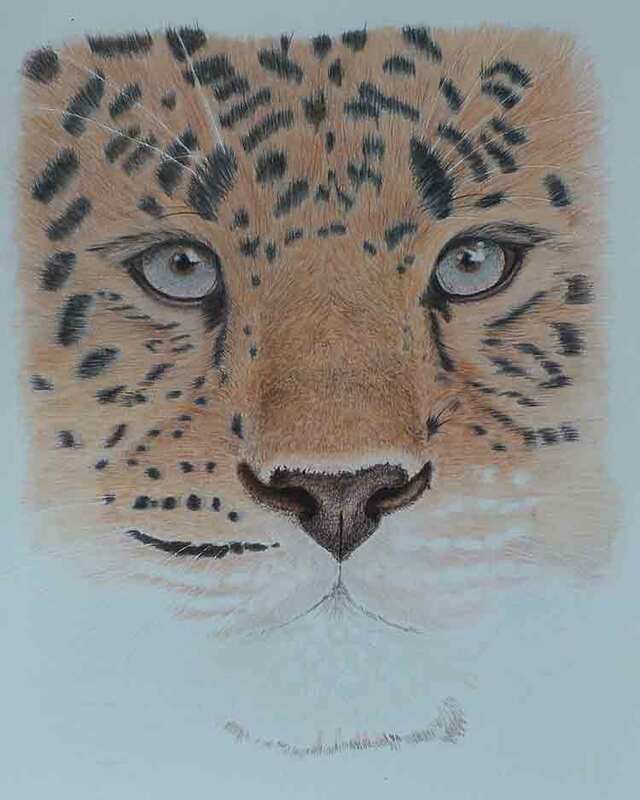 Using Prismacolor, Derwent Artist, Faber Castell Polychromo, Caran d’Ache Luminance coloured pencils. Both second and third layers done and blended with odourless mineral spirits. First layer top right hand corner started. Prismacolor are lovely and soft, Faber Castell Polychromos firmer but last longer before re sharpening required, plus enable finer detail. 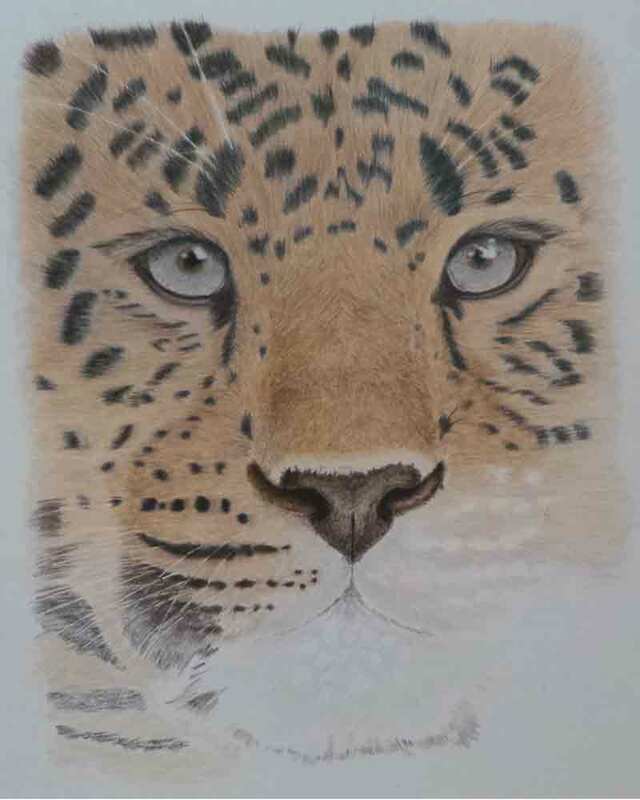 Further layers added to fur and blended again. 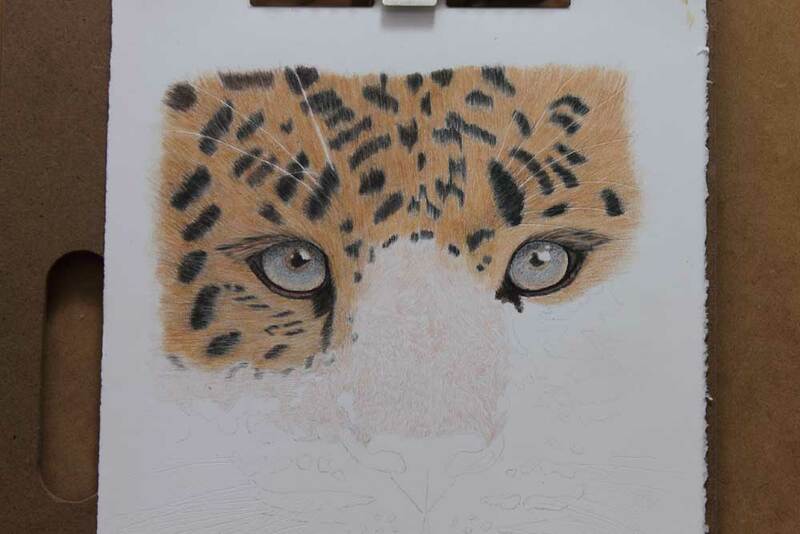 First and second stages completed to eye areas. First layer to nose and cheek areas. Need to order Prismacolor Péche Claire PC927! 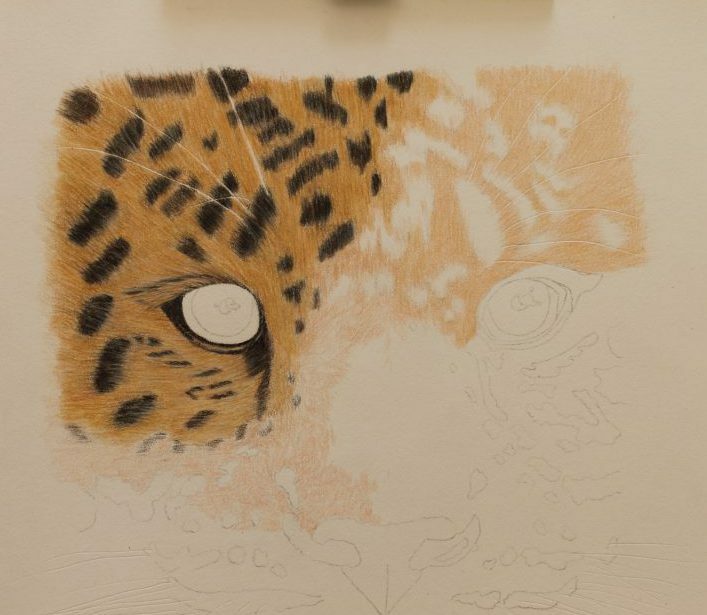 Prismacolor Premier pencils are so lovely and soft, but this piece is taking a lot of this colour! Further layers to nose and cheek areas. Still using odourless mineral spirits to blend, and still only using a medium pressure when applying pigment. 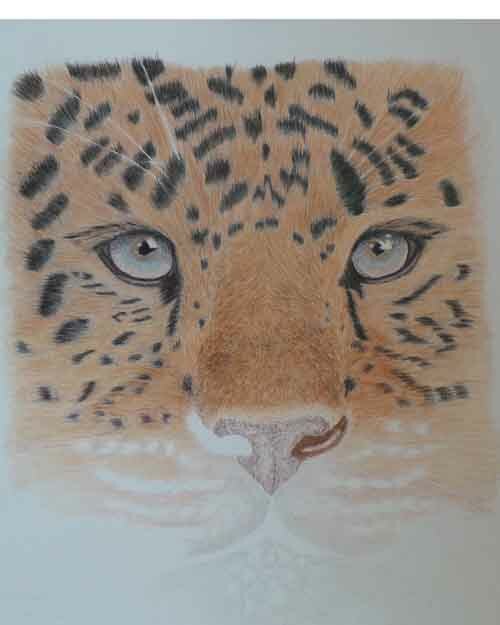 Dark areas of fur are being made by firstly applying dark values of brown pigment followed by black pigment. This is only the second time I have used this medium, and I am finding quite a large difference between different brands of pencil. Continually adding layers through the nose and cheek areas. Trying to follow the direction of the fur in my reference photo, which can be difficult when you have short fur growing in numerous directions in the same area. Noting the colour change down the nose and the fur around the nostrils. Started first layers on the end of the nose to help with judging dark values and retaining lighter areas at the end of the nose. Still using odourless mineral spirits to blend. Further layers to end of the nose, built up from light to dark, leaving some of the light areas to show through to try and create some texture. Lighter areas of fur worked on for the bottom half of the portrait. 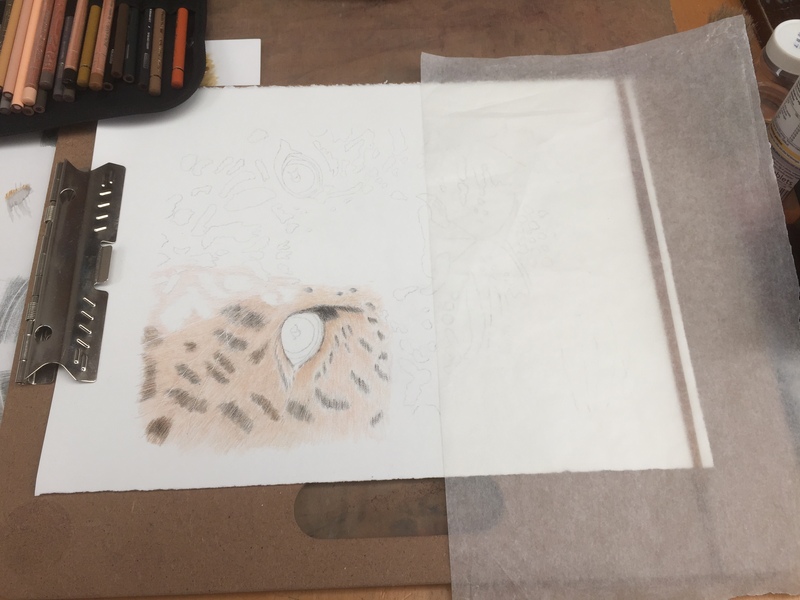 Whiskers have already been placed by using an embossing tool and indenting the paper, so that when subsequent layers of pigment are applied, the pigment flows over the indentations leaving the white of the paper for the whiskers. 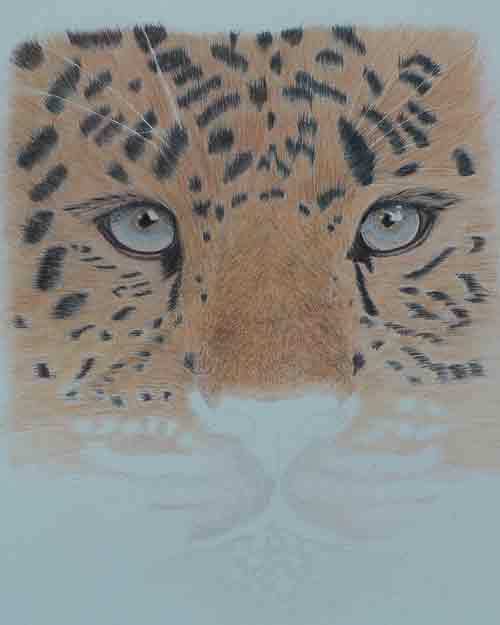 Using coloured pencils is a very slow process, which makes them ideal to leave out and pick up and use for short periods of time, and in between other pieces of work. Continuing with layers of pencil now over the embossed whiskers, and paying attention to my reference photo, I slowly work down the left hand side of the face. My reference photograph has been really clear, but as I reach the lowest part of the image, it becomes difficult to see where dark fur commences and ends. So I restrict the amount of the image I can see at any given time, by cutting out a small square in a piece of plain white paper and place this over my reference photo. Placing the cut out area over the part of the image I am working on, acts as a viewfinder and helps with following and drawing the correct section of the image. Adding layers to right side of the face and the chin area taking care to draw around the areas to be left in white. Several layers are made and blended with odourless mineral spirits, taking care not to bleed black pigment into the whiskers. 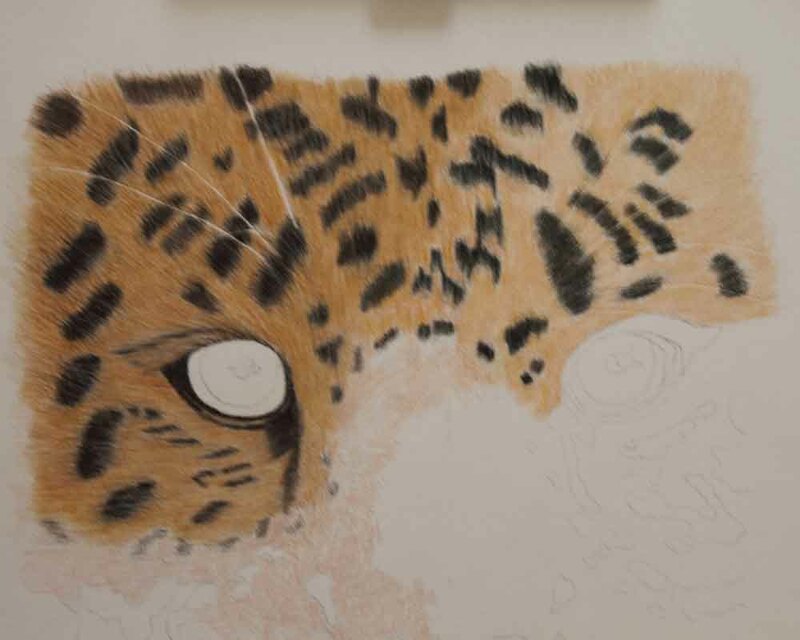 Finally I go over any dark layers that need darkening further, add additional form to the nose area where needed, and using Acrylic ink with a ruling pen, go back over the whiskers where some of the pigment has blended into unwanted whisker areas. I left the image on my easel for a good week, looking at it from a distance every day, touching up areas as I noticed anything missing. 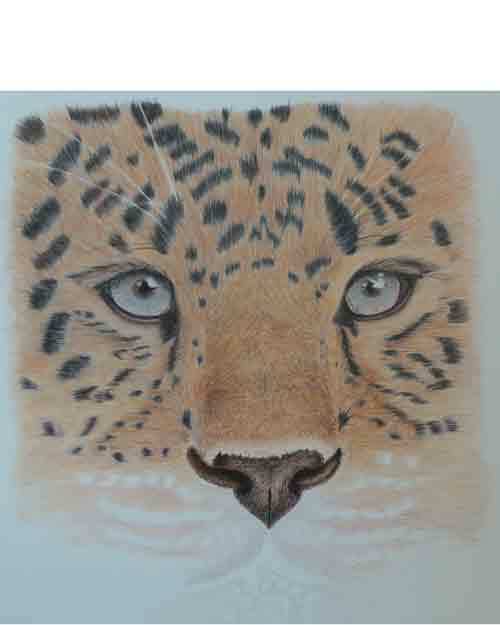 The finished Image can now be seen in the main Gallery. Thank you for following, and remember feel free to get in touch with any questions you may have about this piece of work or any other in the Gallery.